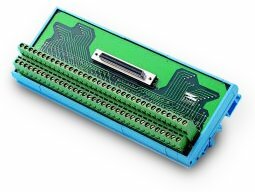 ADAM-3968: 68-conductor interconnection board features an industry-standard HD68 high-density SCSI connector and povides two rows of 34 numbered screw clamp terminals. For use with PMC's MultiFlex family of motion controllers. Note: One ADAM-3968 interconnection board accommodates up to 2 Axes of I/O.